The separate processes of composing a ballad text for a selected tune, and fitting that tune to the text, are inversely related. First, the ballad poet uses the tune as a rough mold by which the stanzas will be structured. Because the poet follows the tune only loosely, the singer, later on, must adjust the tune to fit the ballad text, thereby consummating the ballad’s existence through performance. Between the two artists (poet and singer) and their respective tasks, however, there exists a separation. At its earliest stage, the completed ballad's text and its intended tune are in a mutual state of unity, if only in the mind of the poet. During the intermediary processes (registering the ballad—if it ever was registered—and printing/publishing), the text is removed from the tune. The ballad singer was, and still is, faced with the difficult task of reconciling the two. This essay focuses on the latter part of this re-creative process: fitting the text to the imprinted tune. We must ask both “why?” and “how?” if we are to examine the processes by which a singer reconciles the tune to the text written for it. Why must the singer manipulate the tune to fit the text, especially if that text was composed with that tune in mind? How would a singer go about the extra task of reconciling the tune in his or her mind to a text that may feature an irregular number of syllables and strangely-placed stresses? In answering the first question, I will explore the separation between poet and singer, and ways in which a tune’s mobility might further this separation. The second question will explain various steps a singer might need to take in order to close the gap between ballad and tune. In answering the “how?” of ballad singing, I will discuss relevant differences in specialized terminology, musical rhythmic notation, and poetic analysis. I will also examine common steps taken by singers to complete this portion of ballad making. For the purposes of this essay, I am limiting my definition of ballad to the combination of text and tune, and thus do not include a discussion of the third important medium of a broadside ballad in the seventeenth century: the woodcuts and other ornaments, which do not directly bear on the way a ballad is sung. Any references to the ballad as a physical object will be differentiated from the ballad as a song. The early modern author of a sung ballad would have begun composing lyrics with a specific tune (or tunes) in mind. Although a ballad would began its existence joined to its tune(s), the two would quickly separate during the processes of publication and circulation. From the moment a ballad’s author sold his work to a printer or publisher, he gave up “his ‘ownership’ of the ballad,” as Kris McAbee and Jessica C. Murphy note. This transfer of ownership was both legal and practical, and included any control over how people would sing that ballad, such as the variant of the specified tune that would be used, and how text and tune would fit together when ballad sellers and their customers sang the ballad. The ballad would also undergo a number of transformations before it fell into the hands of its first known performer: the ballad seller. Assuming a completely legal process, the ballad would need to be registered with the Stationers’ Company. Next, the printer would print copies onto single sheets of paper, or broadsides. Then, the publishers would distribute the ballad sheets to booksellers or directly to the ballad sellers. In order to make their investment profitable, ballad sellers, usually hawkers on the streets of London or chapmen who carried the broadside ballads out into the countryside, would then need to give an "exciting performance" (Hehmeyer). By the time the ballad began its life as a performed work, then, its text would have already traveled numerous steps away from its origin as a text unified with its tune in the mind of the author. During any of these steps, and through the work of any of these agents, the lyrics could change, either intentionally or by accident. The relationship between lyrics and tune was further complicated because the tunes themselves evolved. In the oral tradition of ballad singing, the variants of a given tune are as numerous as the singers who sing that tune. As Revell Carr notes, "Individual performers introduced their own unique variants of the melodies in a range of contexts, resulting in a great degree of variation in the melody" (Carr). Some of these variants, for which we have recorded notation, are quite noticeably and even drastically different from each other. "Greensleeves" is perhaps one of the most interesting of these tunes: Simpson, in his 1966 book of ballad tunes, publishes "six variants of Greensleeves" (Simpson 268-278). Each variant, while sharing key similarities, is notably different from the others, with variations in range (the difference between the tune's lowest and highest notes), contour (the relative note-changes throughout the tune), mode (the specific collection of notes used), and even musical meter (the passage of music through relatively measured time). Likewise, "Packington’s Pound" has three variants (Simpson 564-570) printed in Simpson’s book, and the National Library of Scotland's Rosebery collection of ballads includes a further variant of Simpson’s third version of the melody. The changes in a tune caused by its drift through time, across space, and through the voices of various singers, as well as its associations with different ballad texts, could potentially mean that the variant that a singer was accustomed to differed significantly from the tune as it was imagined by the poet. Such differences can cause difficulties for the singer in fitting the tune to the text. These difficulties are partially mitigated in the rare instance in which the first stanza is correctly underlaid to the tune (see above image). With many ballads containing eight or more stanzas, however, printing text underlay for anything more than that first stanza would not be feasible. Variation in syllable count and placement of metrically-emphasized syllables in non-notated stanzas limits the utility of the single-stanza text underlay. Furthermore, we cannot assume musical literacy on the part of the singer, either in the early modern period or in the present moment. The intermediary processes of ballad making (registration, printing/publication, and distribution), the tendency of a tune to change as it passes between texts and people, and the impracticality of text underlay to music notation all serve to separate poet from singer. This separation was both inevitable and necessary if a ballad was to be profitable, widely disseminated, and used in various contexts. Tunes also change because the tradition of singing ballads is a folk tradition, that is, a tradition in which the creator of the tune-structured text hands over ultimate control of his creation to his audience, which includes the performer/seller. The separation between poet and singer both facilitates and necessitates the transfer of power from one to the other. Singer manipulation of the tune was (and still is) necessary, given the circulation process a ballad text underwent, which separated authorial imagination and intent from the final consumption and performance of the product. Because a poet might introduce irregular syllabic distribution (a topic to be discussed below), the malleability of the tune was a valuable feature of the ballad. In the transfer of control to the ballad-consuming public, the singer took on a more active role in fitting tune around the text, thus becoming more fully a part of the ballad-making process. Having explored the reasons behind the need for a tune to be altered to fit its ballad texts, we now turn to the more practical question: how does a singer engage in altering a tune? In some cases, a wide array of printed tune variants provides the present-day ballad singer with many rhythmic options, but in many cases, the irregularities in a ballad’s poetic rhythm continue to make this process difficult. This difficulty would have been even greater for the early modern ballad singer, who might not have had the luxury of multiple printed tune variants on hand, or even the musical literacy necessary to use such a resource. For both early modern and contemporary singers, sensitivity to the salient features of a tune that could potentially facilitate poetic irregularities would have been helpful, and sometimes necessary. The rhythmic irregularities found in ballad texts vary in the degree of difficulty that they present to the ballad singer. In some ballads, these irregularities are nothing more than an occasional extra or missing syllable. Often, a small irregularity of this type will match an irregularity found in a structurally corresponding part of the stanza. For example, if the first “b” in an a-b-a-b quatrain has an extra syllable, that irregularity is often replicated in the second “b”. These irregularities tend to be minimally awkward, if at all. In other ballads, these extra or missing syllables are greater in number within a single stanza, and might not be evenly distributed around metrically-accented syllables. The more syllables added or left out, the more awkward the ballad’s rhythm will become, and the more steps the singer will have to take in order to get the tune to fit the ballad text. In this section, I will provide examples of both smooth and awkward irregularities. However, my primary focus will be on the latter: the rougher varieties of metric and syllabic irregularity. To understand how tunes might be altered, it is necessary first to recognize the distinctions between reading a stanza and reading a tune. Poetry and music often share a language, but they can – confusingly – define certain key concepts differently. Musically notated examples with text underlaid will be shown throughout, alongside analyses of the ballad poetry. One notable similarity between reading poetry and reading a ballad tune is the relationship between emphasized syllables and notes. This similarity facilitates the writing of ballad text to a tune, and helps the singer to reconcile that tune to the text. Also comparable are the division of a stanza into lines and the division of a tune into phrases and sub-phrases, the division of a line into poetic feet and the division of a sub-phrase into measures, and the division of the foot into syllables and the division of the measure into beats. Despite similarities at the structural level, concepts of poetic and musical form differ in application. Particularly important is the difference in the ways that poetic and musical theories define their concepts of meter. For poetic rhythm, if one describes a poetic object as being in “iambic pentameter,” one defines said object as a “line” of text, divided into five “feet,” with each foot comprised of a weak syllable followed by a stressed syllable. In music, if one describes a tune as being in “3/4” meter (pronounced “three-four”), one is describing a relative division of time called a “measure,” in which a strong beat is followed by two weak beats, each beat being of equal temporal length, and each beat being divided into two equal beat divisions. In poetic meter, the label “iambic pentameter” gives a specific and concrete analysis of a line of poetry, telling the reader how many and what type of poetic feet are in that line. In musical meter, the label 3/4 gives only a basic framework for the division of time. The musical label says little about the specific organization of notes within that framework, and nothing about how many measures are in the tune or how those measures are structurally organized. For poetry, meter describes concretely the organization of syllables and feet. For music, meter is an abstract framework. It is also tempting to conflate the similar concepts of the poetic foot and musical measure as basic referential rhythmic units. The difference between the two might best be seen in a specific rigidity of accentual patterns that musical meter defines. The first beat of any measure is always the strongest beat. This “downbeat,” in poetic terms, would be the stressed syllable within a poetic foot. Should the stressed syllable happen to be at the beginning of the poetic foot, the measure and foot will align. If, however, the foot begins with an unaccented or “weak” syllable, the foot will begin at least a part of a beat before the beginning of a measure, thus overlapping the temporal boundary set by the measure. A more appropriate musical counterpart to the poetic foot would be the phrase or the sub-phrase. Although not identical as a concept, the phrase can begin on a weak beat in the same way a poetic foot can begin on a weak syllable, overlapping the measure. The musically-literate singer is accustomed to reading all anacruses at the end of a measure, while seeing the beginning of any metric unit as a strong beat. The fact that the anacrustic syllable falls on the beginning of the foot and the poetic line can be one of the earliest points of difficulty for any ballad singer matching tune to text. When poetic and musical meters combine in a ballad, the stressed syllables will fall on the strong beats within the tune. In the case of the text-underlaid example above, this strong beat is the first beat in every measure. This system of musical meter, with its measures, beats, and beat divisions, allows a high degree of malleability within any given tune without disrupting the metered passage of time. If a foot has more syllables than there are notes in that part of the tune, it can be broken up into smaller metric values in order to fit within the corresponding division of musical time, usually a half-measure, measure, or two measures with ballads. If there are fewer syllables than notes, a syllable can be sung over multiple notes. This can be seen in Example 1 on the stressed syllable “Jew,” where the slur (curved line) above the two notes indicates that the singer should extend the syllable smoothly through both notes. While "Jew" is stretched because the line has too few syllables for the tune, we also often find lines with too many syllables placed on one end of the stress. This problem appears in the same ballad stanza excerpted above. First, I will display the entire tune with its strong and weak beats indicated in underlaid scansion notation (where “U” represents unstressed and “_” represents stressed beats). 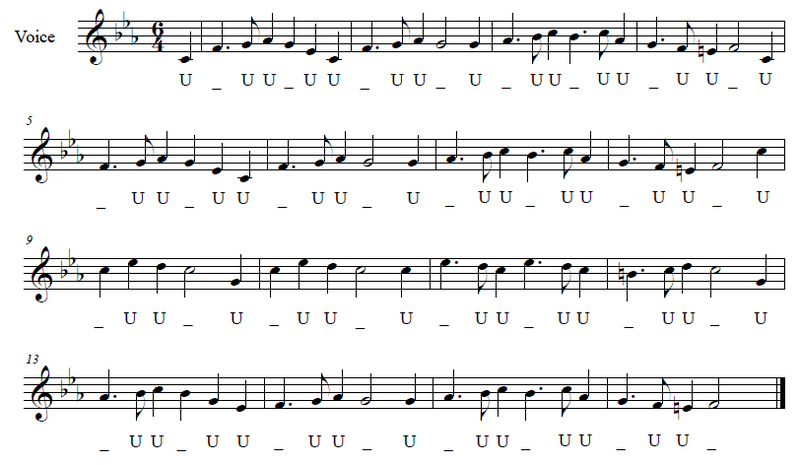 If we assume two lines of text per line of music, this tune can be seen as mostly conforming to an anapestic tetrameter, with the anacrustic first note (first line) and last note of the first three lines corresponding to the first syllable of an iamb. For the most part, the first stanza of Huntington 402424 (cited above) conforms to this meter. We have already seen one point within this stanza in which a syllable must combine the length of two notes. I will now display the last line of music with the stanza’s last two lines underlaid, to demonstrate what the singer must do rhythmically to accommodate two extra syllables. Notes affected by this irregularity are shown in red. In this last line of text (beginning with “to cajole”), we can see that the poet has added a syllable to the beginning of the first foot, but has taken a syllable away from the next foot, repeating that pattern for the rest of the line. Musically, in order to retain the stress on the syllables “-jole” and “-muse,” the singer is forced to break up the preceding note values into two parts. This effect, as can be heard in a recording of the first stanza, creates a sense of unevenness: the stressed symbols sound quite smooth, but their unstressed counterparts sound “crunched” together. “The Sorrowfull Damsels Lamentation For Want of a Husband,” sung to the tune of King James’s Jig, features too many syllables in a refrain. The refrain for each stanza (the last two lines) has numerous extra syllables, intensifying the aforementioned “crunched” feeling upon hearing the ballad. Again, I will first begin by displaying the unaltered portion of the tune, to be followed by a version marking the changes necessitated by poetic irregularities. For this example, I will discuss each alteration, proceeding from the least awkward for a ballad singer to the most awkward. The last measure of the first scanned excerpt above is a half note (two beats) followed by a quarter note (one beat and a half note, with stressed syllables occurring on the half notes. In the two feet containing the words “-bands and I can get none,” the word “can” is an extra syllable, making it necessary for the singer to break up the half note into quarter notes. The even distribution of syllables over this half of the last measure eliminates any syllabic crunch that otherwise might occur. The resulting poetic foot transforms the final iamb into an anapest. The first alteration in the above text-underlaid example presents an increased level of difficulty for the singer. The irregular foot, containing the words “and to make moan,” adds the syllable “to” to the otherwise smooth anapest “and make moan.” A slight crunch can be felt as the quarter note in that measure is divided into two parts, transforming that anapest into a quartus paeon foot. The second alteration in the text-underlaid example is by far the most awkward of the three shown. It occurs on the foot containing “to see so many.” In the unaltered melody, only one note occurs between the stressed syllables “moan” and “many.” This note must now somehow accommodate three syllables. This use of three syllables in the place of one or two has transformed this particular line from the tetrameter suggested by the tune into a pentameter (to see | so man | -y get Hus | -bands and I | can get none.) The attempt to fit this pentameter into a tetrametric tune forces the singer to decide which poetic stress to ignore. In the recording above, the singer was directed to ignore that first iamb. By doing so, the singer effectively created yet another quartus paeon foot, but in this case, the quartus paeon occurs in half of the amount of time as its predecessor. The crunch effect is much stronger. Just as the tune must guide the structure of a ballad stanza, so also must the parsing of weaker syllables around the strongest syllables guide the singer as he or she approaches a new ballad text. For the early modern ballads discussed in this essay, this was not a collaborative process. Once the ballad had left the poet’s hands, it would be sung to numerous variants of the imprinted tune (assuming a tune was even imprinted! ), and would be subject to the whims of the individual singers and the needs of the specific social context of the performances. The business models surrounding the copying, registration, printing, distribution, and sale of ballad sheets created a separation between the poet and singer, tune and text. This separation was intensified by local variations in tune, individual interpretations, and varying social contexts. It was the task of the ballad seller and his or her customers to reconcile the tunes in their minds to the texts they were selling or purchasing. As demonstrated above,the ballad poets did not always follow the tune’s guiding structure very strictly. Singers therefore were required sometimes to accommodate extra or missing syllables, or even the occasional extraneous foot. In closing, I would like to offer a brief practical guide to this vocal act of making a ballad. 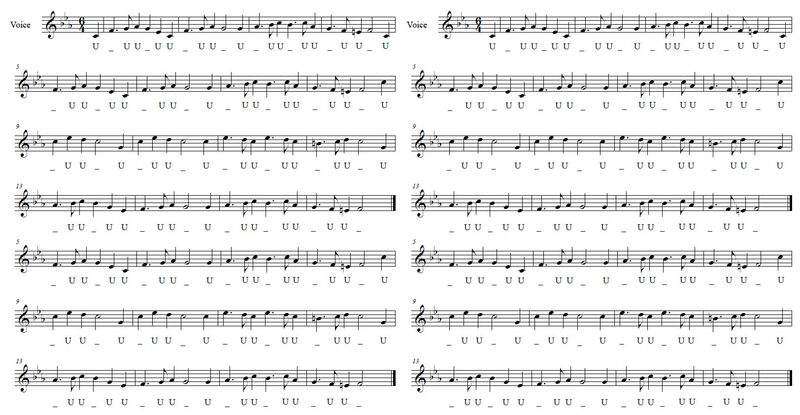 Stressed syllables and strong beats are the points at which the tune and text align. The singer must be familiar with, at minimum, those points within the tune, which can be accomplished by looking at the written tune, or if one cannot read the tune, listening to a recording of someone singing or playing that tune. With either a good sense of poetic rhythm or an adequate scan for stressed syllables (preferably both), the singer may then begin to shape the syllables and notes around those aligned strong points. Although specialized knowledge of music or poetry would be very helpful in this process, it is by no means necessary. The original singers of English ballads came from a wide variety of trades or walks of life, and they would have had access to varying levels of education. The act of making a ballad by singing was and still is meant to be accessible to everyone. Discussion of "Fitting Texts to Tunes: Separation, Reconciliation, and Melodic Malleability"
Version 7 id 1014 of this page, updated 07 May 2017 by Andrew Griffin. Created by Brian Reynolds.